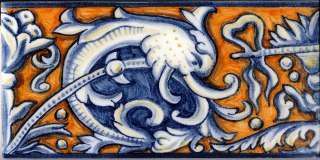 This beautiful border tile is taken from the border design on a large dish belonging to the Medici family. It is rich in design, colour and texture, as it has a crackle glaze and then a dark pigment has been rubbed into the crackle to make it stand out and look aged. The size is 2.5" by 5". Available hand painted or digitally printed.